Kindness for all living things. It's what brought a group of 31 idealistic people with a dream together a little over three decades ago. It's what created the world's largest no-kill animal rescue organization in the world. 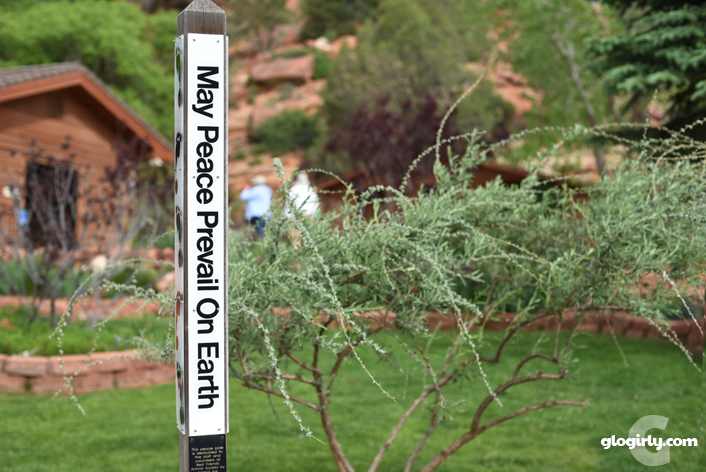 It's 3,700 majestic acres of the Utah landscape Best Friends has appropriately named Angel Canyon. 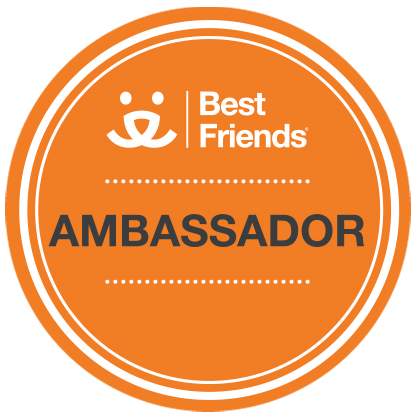 It's what connects a family of over 1,500 Best Friends Network Partner organizations across the country. And it's about a common goal. Save Them All. 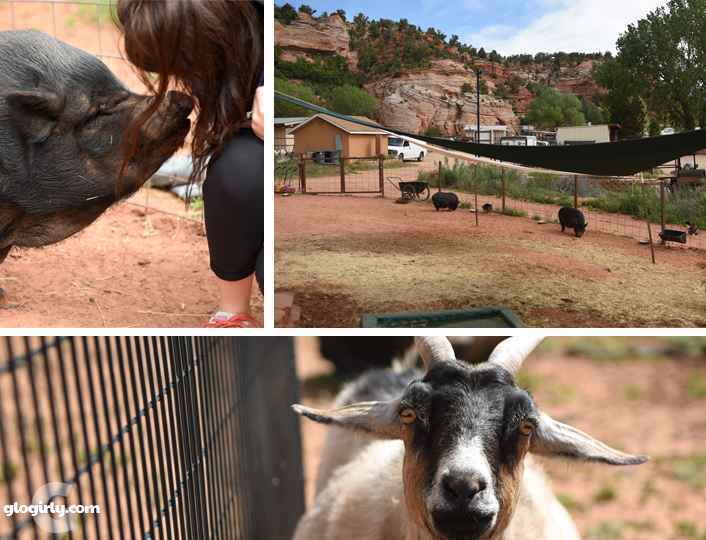 There are just so many words to describe my experience visiting the Best Friends Animal Sanctuary in Kanab, Utah for the first time. So many, I find myself almost speechless. How do you describe something so beautiful, so inspiring, so moving, you physically feel it in your heart? How do you describe something that for reasons you can't explain, brings you to tears yet fills you with joy? If I had to choose just one word, it would be Kindness. Welcome to the first of three chapters of my Best Friends experience. Katie and Waffles are taking the day off and turning the blog reins over to me (Glogirly) for the first time in the eight year history of our little cat blog. Don't worry, they'll be back to their usual antics in no time, that is once they forgive me for taking almost a thousand photos of something or someone other than them. I hope you enjoy this as much as I've enjoyed sharing. And I hope Best Friends touches you as they've touched me. I can't believe it was only a week ago that I was returning home from my visit to Best Friends. As much as I love to travel, often the best part of a trip is coming home. Please don't tell Katie & Waffles, but this trip was very different. I didn't want it to end. One of the new friends I made, Barb, who has what many would call a dream job working for Best Friends and living just steps away from Angel Canyon told me that the coral sand gets in your veins. Those that visit Best Friends find it nudges it's way inside of you. It stays with you and draws you back. I believe her. And I know I'll be back. Horses and Rabbits and Cats, Oh My! The sanctuary is home to all kinds of animals. Horses, pigs, goats and birds. Cats, dogs, rabbits and guinea pigs. They've been abandoned, abused or surrendered. Some just cast away. Even wild animals in need of rehabilitaion. If we knew every detail of each animal's history our hearts would be forever broken. Best Friends appreciates and celebrates the individuality and potential of every single animal. 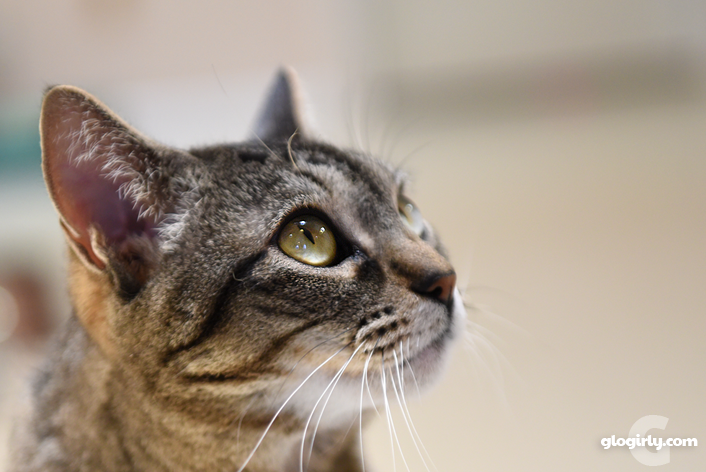 Their ultimate goal is to prepare each animal to be successfully adopted into a loving home. And to stay in that loving home, forever. Some animals need to learn how to just 'be'... and Best Friends totally gets that. A dog that has been abused, or known nothing but fear, may not even know how to be a dog. An orphan foal without a mother to show him the way, needs a mentor horse to teach him how to be a horse. Allowing each animal to learn, at their own pace, that humans are not to be feared but rather are safe, fun and loving is at the core of their mission. This is one of the things that inspired and impressed me the most. It's not just about saving a life, it's about preparing an animal for a lifetime of happiness and love in a real home. It's about doing what's right for that animal. Just minutes after we arrived at Best Friends we were witness to something truly remarkable. 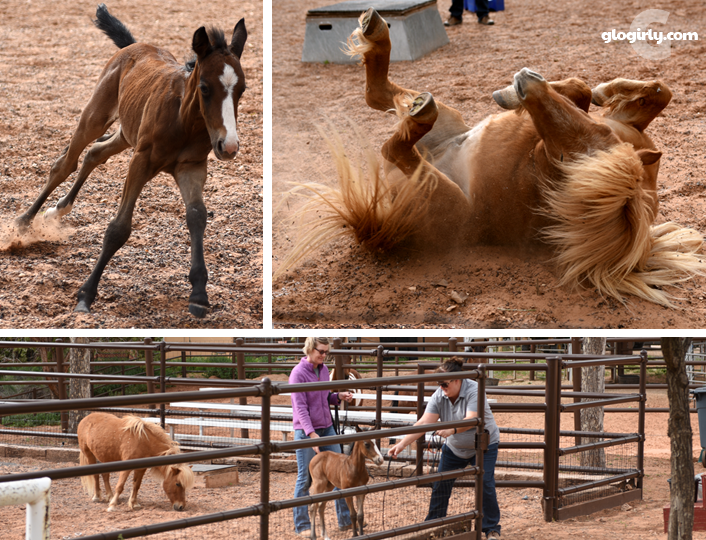 This little orphan foal was taking his first steps outside in the sunshine. He was surrendered to Best Friends after his mother had rejected him. He needed to be bottle fed and had not been in the presence of another horse. The only humans he'd seen were his care givers. 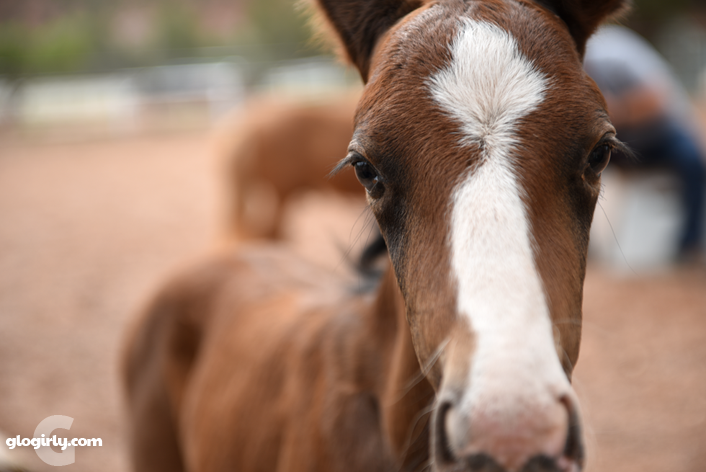 Born on the day the world lost Prince the musician, it was clear what this miracle foal's name would be. What a sight to see. He was introduced to Feather, an adult mini horse, so he could begin to learn how to be a horse. Feather flipped onto her back and rolled around in the dirt. Moments later, Prince copied her and did the same thing. As he gained more and more control of his gangly legs he began to run around the corral. It was pure joy and a rare moment I'm grateful to have been a part of. Just down the path from Horse Haven sits Marshall's Piggy Paradise and a sweet spot for some handsome and inquisitive goats. The potbelly pigs were hilarious and full of personality. They purred like cats when we rubbed their tummies and Roxy, the big flirt above, had a LOT to say. Sadly, many people unknowingly adopt these cute pigs from dishonest breeders that mislead them into thinking they'll never get to be much larger than a small dog. 400, 500, even 700 pounds later, they're abandoned or surrendered. Best Friends works incredibly hard to find new forever homes for these delightful creatures and despite the challenges, they do indeed get adopted. Meanwhile, they live a very happy pig life of mud baths, healthy food, exercise and lots of love. While most of the goats were more interested in soaking up the sunshine, there was the cutest of 'kids' that thought he'd make a great tour guide and followed our every step. The beautiful and natural environments the animals live in provide them the highest quality of life possible. Clean, spacious with plenty of enrichment and loving care that lets them be the animals nature intended them to be. Best Friends' Parrot Garden is home to some of the most exotic and vocal birds in the world. I had no idea the Cockatoo was the loudest bird in the world! Based on my meeting with this spirited guy in the photo, I would have to agree! I've never been up close and personal with these incredibly intelligent birds before and it was fascinating. I met a parrot with a vocabulary of 370 words who could laugh like a human. I met bonded pairs that love and rely on each other so much they can never be separated. They are smart, full of personality and absolutely beautiful. But they are also in peril. Many can live up to 100 years of age! That means many of them have been through a number of homes over the course of their lives. They need a lot of attention and mental stimulation. 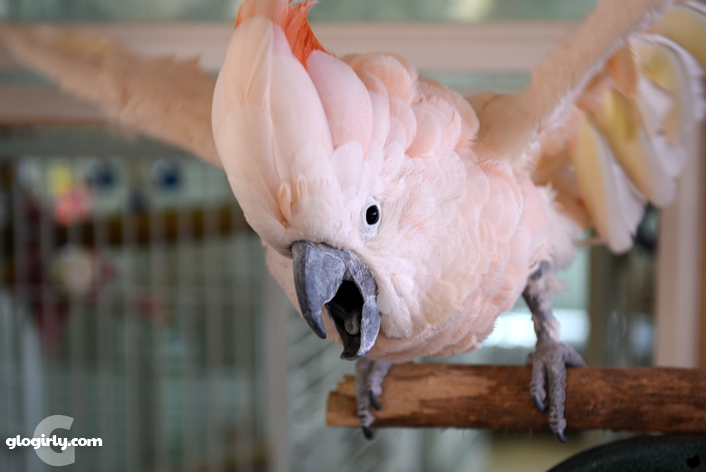 Many come to Best Friends with special needs and Parrot Garden provides a beautiful light-filled tropical environment with plenty of social stimulation, healthy food and veterinary care to help them rest, heal and thrive. It's impossible to have a litter of puppies crawling all over you and not giggle yourself silly. One of the most fun three hours of the trip was Puppy School. 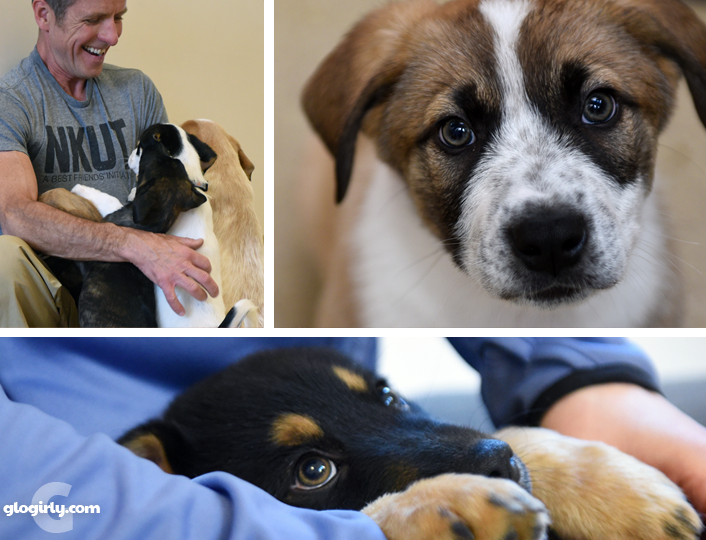 This adorable litter of puppies had never experienced any people outside of their care givers before. We were their first! Our job was to simply have fun, socialize with them, let them explore our cameras and us... all in order to teach them than humans (and humans with big cameras) are safe and fun. It's all a part of Best Friends goal of preparing each puppy for the most successful, happy and healthy life possible with their new forever family. And if all that wasn't enough fun already... we took the whole litter on their very first walk outside. This was the first time they'd even had a collar on. It was puppy-chaos at 100mph! And so much fun my cheeks are still sore from smiling and laughing. From Horse Haven to Dog Town, Parrot Garden to Bunny House, the love and compassion the care givers show the animals is unending. They know each one by name. They know what makes then tick. They speak their language. Nowhere was this more clear than with the bunnies. The sweet young woman caring for them understood their unique needs and was passionate about their predicament. Some were abandoned to fend for themselves, which is impossible for domesticated rabbits. Others were victims of excessive breeding or hoarding. They're so adorable, many people think they're a perfect pet for a child, but that couldn't be further from the truth. Did you know that a bunny can get pregnant at only two weeks of age? And when they give birth, it's often to as many as 15 bunnies at a time. Repeat, repeat, repeat. It's an overpopulation epidemic. Bunny House was peaceful, calm and quiet. For the most part the bunnies make no noise at all. They're some of the most gentlest creatures on earth and the same could be said for their care givers. 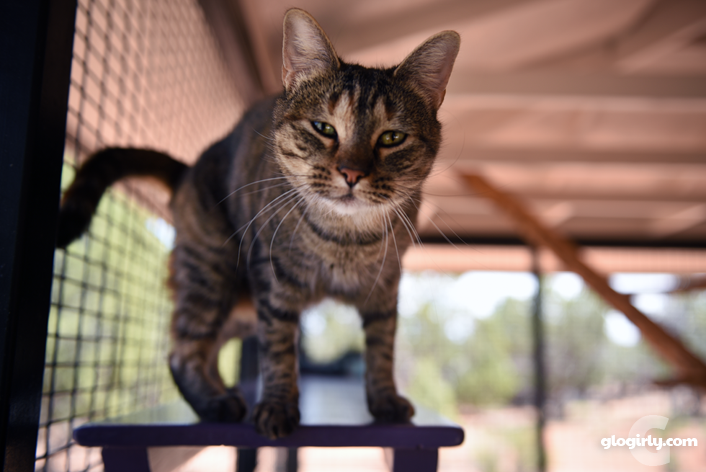 Please join us for an inside look at the beautiful cats of Best Friends and what it's like for them as they prepare and wait for forever homes: CATS of Best Friends Animal Sanctuary. There's SO much more to see! I'd like to invite you to view my entire gallery of Best Friends photos. The best way to view them is to click on Slideshow. Enjoy! Many people and families visit the Best Friends Animal Sanctuary as a vacation. I had the pleasure of meeting a number of people volunteering while I was there that did just that. 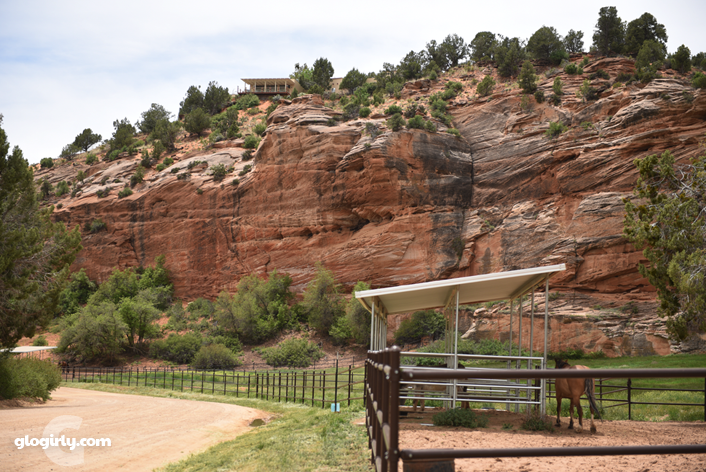 It's an inspiring and meaningful way to experience the sanctuary, help the animals and enjoy the gorgeous landscape. For more information on how to turn your bucket list wish into reality, visit HERE. Special thanks to Melissa, Hannah, Barb and the entire Best Friends family for hosting my trip to the sanctuary. You've each touched my heart and have inspired me by the kindness you show each other and the animals in your care. What a wonderful experience. I've been in the area but not to the sanctuary. It's a stunning area of the country. I'll be going through your photos tomorrow but I'm for bed tonight. I'm glad you had such a wonderful time. My human got SO excited when she heard you were visiting Best Friends! Visiting there is on her bucket list, and she knew you'd come back with so many awesome photos! We are both looking forward to your upcoming posts! I sat down with my notepad to think about my new blog buttons as I watched the slideshow from end to end. It is pure magic and captures the whole miracle of the place from the lovely pups and cats to the last resting place which looks so peaceful, quiet and calm. How wonderful. Your trip was magical in every way and it touched your heart forever. The animals there will now all have a happy and loved life and that in itself is brilliant. No wonder you loved going to visit. Thanks for showing us. What an experience!!! We must put that on our mommy's bucket list! What an amazing experience this must have been. I'm looking forward to the next two installments of your report, especially the one about Cat World! We love this post. You describe (and photograph) your experience so well that we can't help but want to go too (we actually looked into it and what's available). I love that Best Friends is so focused on individual experience with each "resident" - it's obvious the people "get" what really matters, which is the residents themselves. Especially after feeling down and upset about what I read daily regarding the treatment of our animal companions (abuse, abandonment, death, etc), it's a nice reminder that there are also some incredible animal lovers who won't give up fighting for those without a voice. These are the kinds of stories that make it possible to go on and not completely lose faith in humanity. Thank you for sharing them with us. Oh this is so wonderful. That is one place I have always wanted to go. And you describe it so well and makes me want to go even more. The pictures are just the best. Can't wait to hear more. What an experience! Thanks for sharing it with us. Going to Best Friends is a dream of mine...that I hope to make a reality. Oh Glogirly! I'm just filled with emotion reading this post--mostly joy, but a little sadness thinking about those animals in need who CAN'T make their way to Best Friends. You definitely are helping me move this bucket list item up the ranks to DO IT NOW...I love the photos and the moments that you describe and I know there is just so much that you won't even be able to write about because, as you said so well it gets into your bones. I will share this post! I hope Katie and Waffles forgive you for taking over the blog, it's for a wonderful cause. And they can cook up something special for their return! Can't wait for the next post!! It looks like an amazing experience. Thanks so much for sharing it with all of us. We can't wait to see Cat World in your next post. Looks like that was an amazing trip. Can't wait to see more! I love all these photos! These animals deserve loving homes! This is such a wonderful place. I helped sponsor a cat called Maggie, who was rescued by Angellicle Cat Rescue in NY. She went there, by any chance did you get to meet her? Whoa! This is a Popcorn Park Zoo times a million!! TW knows the closest she'll get is the PPZ but loves reading about this little bit of heaven on earth. Jon Stewart is also opening an animal sanctuary is either NJ or NY. Thank you for sharing. Loved this post so much! I have always wanted to visit Best Friends. I will be going there a few days before heading to BlogPaws and just can't wait. Look forward to your next installment. I am incapable of finding the right words to describe how this experience must have been for you. You are truly blessed to have been a part of it all - I know if I'm ever lucky enough to go, I will probably be rendered emotionally crippled, as I know the sheer magnitude of the landscape, the animals, the love, the compassion, and the mission would overcome me. I couldn't wait for the next installment, so I jumped ahead and looked at all your pictures. What a wonderful post! I hope I can go someday. It would be hard not to want to take home a new furry friend if I went there. Now that is a place I would never want to leave. A once in a lifetime experience for sure, and thanks to you I feel as though I was really there! Thank you for sharing these photos about your trip. It sounds amazing and I especially look forward to the cat post. Your pictures are so gorgeous! I was fortunate enough to go there last year, but missed several of the areas you photographed (like the bunnies and puppy preschool). It is a place that I definitely plan on returning to many times over. I loved volunteering there and met the sweetest older couple who had driven across the country from South Carolina to adopt a senior black kitty! It was amazing and something I will never forget. I am very much looking forward to your Cat World pictures. photo 174, now you're talkin cat beds !!! That sounds like a great place to visit as well as support! It sounds like a little slice of heaven. Concats on bein' chosen to go and glad you had a good time. Mommy says she once dated somepawdy who had one of those birdys and she can relate. Her eardrums almost busted from da noise. MOL Great fotos. Sounds like a great sanctuary. Glogirly, what a wonderful experience this obviously was for you! And the way you shared each beautiful moment as it unfolded was so intimate and eloquent. It made Mommy Jenny and me feel as though we were there experiencing it as well. You have a lovely way with words my friend. Thank you for sharing this with us. Your photos are beautiful too! Does Our Mom Have Fur? What's the Craziest Thing YOUR Cat Does?